Bar on 1940's round dial - What is this thing? Thread: Bar on 1940's round dial - What is this thing? I have an early 1940's round dial, no ELSR, previous owner did a VFD conversion with an Frenic-Mini. 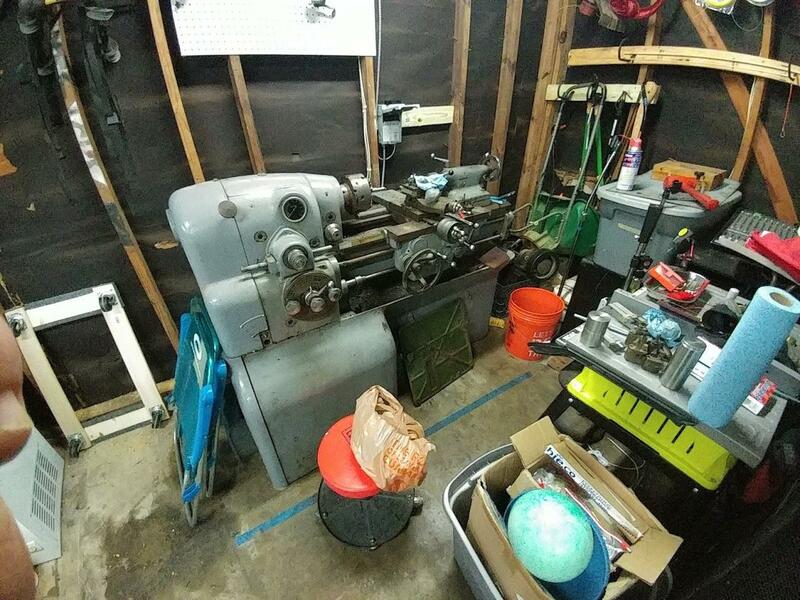 I finally got the thing running over the weekend and took some of my first cuts successfully, but there's something on the lathe that eludes me, and I am having a hard time finding out exactly what it is, even from a PDF of the official manual. Specifically, I'm wanting to know about that lateral bar behind the thread/feed selector. It's fixed in place with a socket head (allen) screw, but it clearly looks like it should be a thing that's moved under certain circumstantial needs. All in all, I'm quite happy with the lathe. I need to figure out what's wrong with the potentiometer wiring for the VFD, but for now I can adjust the speed at the VFD itself. Its a carriage stop. I'm familiar w/ square dial 10EE's. On my old square dial you could attach an indicator, micrometer heads or a hard stop. But yours looks like its missing some pieces, is incomplete. without seeing the cross slide in the pic, my guess would be it's to shut the cross slide down when it hits the rod during threading. I'll bet that rod slides both ways and can be set to stop at a certain point each time. Different than the more modern Monarchs, but non the less, a nice feature to have to take out the thread feeding when you hit the stopping spot. that's my guess. I have an early 1940's round dial ... there's something on the lathe that eludes me, and I am having a hard time finding out exactly what it is, even from a PDF of the official manual. What you have is a shop-made replacement for the stop bar, which others have already identified for you. But yours is not original. The original bar had notches cut every half inch and latch-type mechanism inside a little rectangular casting on the left end that allowed the bar to be repositioned. Your latch was replaced with a block of metal and a cap screw to take the place of the original positioning mechanism. The stop bar was used in conjunction with either a micrometer or other adjustable stop, mounted on a small dovetail on the left end of the carriage. I can't tell for sure, but your dovetail appears to be missing (based on your second photo). What's the serial number and build date of the machine? (Look on the plate on the front of the base, to the right of the rectangular door at the operator's feet.) 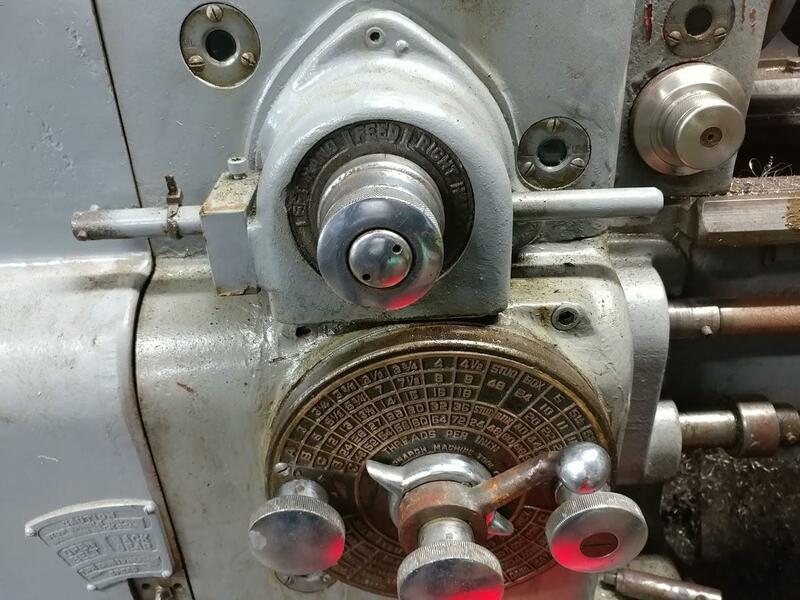 If the data plate is missing, you'll find the serial number stamped next to the tailstock flat way on the right end of the ways.